The following story does a good job of showing how personal wealth has suffered lately and how it's not likely to rebound anytime soon. I was surprised to read the net worth per US household is $455,173 including the value of the houses. However that's the average. The reality is a skewed distribution of personal net worth. The federal public debt, which was $6.3 trillion ($56,000 per household) when President Obama entered office amid an economic crisis, totals $8.2 trillion ($72,000 per household) today, is headed toward $20.3 trillion (more than $170,000 per household) in 2020, according to CBO's deficit estimates. That figure would equal 90 percent of the estimated gross domestic product in 2020, up from 40 percent at the end of fiscal 2008. By comparison, America's debt-to-GDP ratio peaked at 109 percent at the end of World War II, while the ratio for economically troubled Greece hit 115 percent last year. If you want to see a slide presentation with graphs showing more about the skewed distribution of wealth in America and its impact on our citizens, go to this link published by Business Insider. The numbers are from 2007 but the message is the same. Maybe the reason we don't have more of the general population applying the golden rule is because of the example being set by the top few percent of the net worth population who seem intent on garnering all they can for themselves. No wonder so many people are up in arms about where America is going. For those of you who are not able to open this link I have included the slides at the bottom of this page. In closing, I want to be clear that I am not opposed to unequal distribution of wealth per se. Nor do I advocate redistribution of wealth through social entitlement programs. 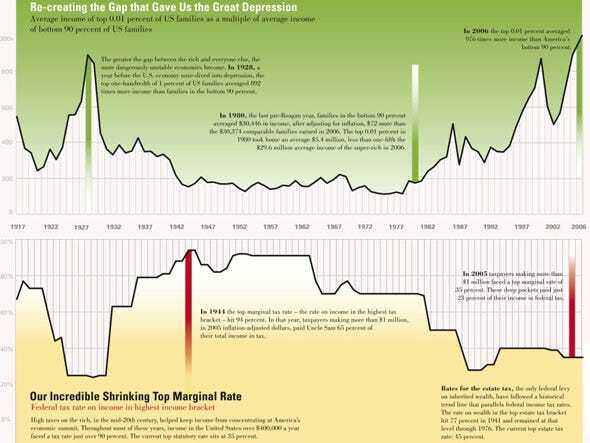 WASHINGTON — Americans' long journey to regain the wealth they lost in the recession is stalled. Households failed even to run in place during the April-June quarter as sinking stock prices eroded wealth. Stocks have since recovered about two-thirds of those losses. But based on last quarter's data, household net worth would have to surge 23 percent to reach its pre-recession peak. Net worth — the value of assets such as homes and investments, minus debts such as mortgages and credit cards — fell 2.7 percent, or $1.5 trillion, last quarter, the Federal Reserve announced Friday. It now stands at $53.5 trillion. The drop from April to June was the first quarterly decline in Americans' wealth since early 2009. Before then, net worth had risen slowly for four straight quarters. Economists generally think household wealth has ticked up in the July-September quarter because of higher stock prices. Yet given last quarter's setback and expectations of scant gains ahead, some economists have pushed back their forecast for when Americans will regain all their lost wealth: not until the middle of this decade. Their stagnant wealth probably will keep Americans from spending freely — and the struggling economy from picking up strength. Consumers tend to spend according to how wealthy they feel. And their spending accounts for about 70 percent of the economy. For now, people are saving more and paring debt, Friday's data showed. One reason that economists foresee only slight gains in wealth is they expect real estate values to stay weak. Residential real estate accounts for 32 percent of net worth; individual stocks make up 13 percent. The balance includes retirement accounts, taxable mutual funds, bank accounts, bonds, and possessions such as cars and jewelry. During the recession, sinking home equity and stock prices made shoppers skittish. More than a year after the recession is thought to have ended, the housing and stock markets remain fragile. That's why most Americans aren't spending as much as they typically do after recessions. Spending grew at an annual rate of just 2 percent last quarter, about the same pace as in the first three months of this year. Most economists think Americans will spend at about the same pace, or only slightly better, in the current quarter. By contrast, after the 1981-82 recession, consumer spending averaged a robust 6.5 percent pace during 1983. "Consumer spending is going to show only stunted growth this year because the wherewithal to spend — jobs, income, wealth — are only inching higher," said Ken Mayland, president of ClearView Economics. Carla Fehribach, a retired airport ticket agent in St. Louis, said the stock market's failure to generate any real growth this year has made her more cautious about spending. "I'll feel a little more comfortable about spending more if the stock market and the economy turn around," said Fehribach, 67. Americans' home equity isn't making up for the loss in their stock values. Last quarter, U.S. real estate values ticked up a scant 0.3 percent compared with the January-March period. And many economists expect the home market to weaken further, especially because a federal home buyer tax credit has expired. Most expect home prices to decline, on average, 5 percent to 10 percent by the middle of next year. Some optimism about stocks has been sparked by the gains they've made since June 30. The Standard & Poor's 500 index, a broad gauge of the market, has recovered most of its losses from the April-June period. That translates into modest advances in wealth since the April-June period ended. For the year, stocks are up just under 1 percent. Though the S&P 500 remains 28 percent below its peak on Oct. 9, 2007, employees who have stayed invested in 401(k) plans and continued to contribute have fared better. About 78 percent of them now have more money in those accounts than before the market top three years ago, according to estimates by Jack VanDerhei of the Employee Benefit Research Institute. Scott Nieberg, a St. Louis veterinarian, says his retirement account is worth about what it was a decade ago. Nieberg, 53, says he has all but given up hope his nest egg will grow significantly anytime soon. His business would have to improve significantly for him to feel comfortable enough to take a vacation, Nieberg said. "In a down economy, you just work hard. We used to take vacations. Now, we take weekends." AP writers Dave Carpenter in Chicago, Alan Zibel and Christopher S. Rugaber in Washington and Christopher Leonard in St. Louis contributed to this report. This chart shows average income of the top 1% as a multiple of average income of the bottom 90% compared to the top marginal income tax rate(via The Nation). Click here for bigger version of the chart above. Click on each of the graphs below to view the graphs in a new full sized window. These graphs show various aspects of our skewed income distribution and its impact on the citizens of our country.